Former Toro Rosso driver Brendon Hartley will remain part of Porsche's factory driver programme in 2019, it has been confirmed at the manufacturer's Night of Champions event in Stuttgart, according to f1i.com . However Hartley is not currently part of the any of the team’s sports car formal named line-ups for 2019 so far announced, which include a four-car factory GT effort for the Le Mans 24 Hours. The Kiwi has had links to Porsche since 2014, and was part of their 2017 Le Mans LMP1 victory. He remained on the books this year despite his move into Formula 1 with Toro Rosso. Hartley had felt confident of keeping his seat at Faenza next season, but learned after the Abu Dhabi Grand Prix that he was to be replaced by rising Red Bull junior Alexander Albon. That's left the 29-year-old looking around the world of motorsport for new challenges - with the ABB FIA Formula E championship one possibility. Porsche is due to enter the all-electric series next year, making Hartley the ideal driver for the team's inaugural season. Porsche motorsport chief Fritz Enzinger said that the squad's first choice of driver in Formula E was “already decided”, and that the name would be "announced shortly" ahead of the start of spring testing. 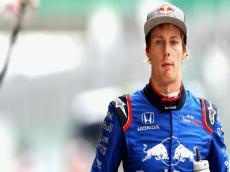 Even so, Hartley has admitted that he is disappointed to be leaving Formula 1 after a single season. Although he only claimed four points over the course of 2018, he has been fulsomely praised by Toro Rosso's engine partners Honda for his contribution to their programme.